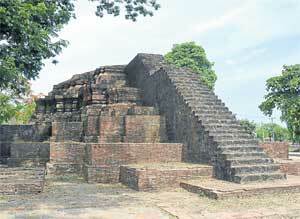 Not many people know that centuries ago there was a royal palace in the northern province of Phitsanulok. Known as Wang Chan, it served as the royal residence for several kings of Ayutthaya, including King Naresuan the Great. Wat Sri Sukhot near Chan Palace. Unfortunately, only the ruins of its foundations, walls, gates and some excavated artifacts are all that remain visible today. "It was named Wang Chan probably because it was made of sandalwood (mai chan in Thai). 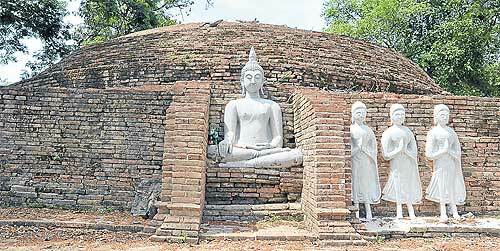 It must have been a model and precedent for the Chandrakasem Palace in Ayutthaya," archaeologist Nattaya Koraneekij said, adding that Wang Chan is mentioned in a number of historical documents. Excavation on the forgotten palace began in 2002 after a school located at the site had to be knocked down. Data from an archaeological survey conducted earlier were found to match with a map of the province produced in 1901 by Prince Naris and pointed to the area as the site of the former palace. The prince had noted that he saw a mound as well as the foundation of a structure that rose about 1m from the ground. 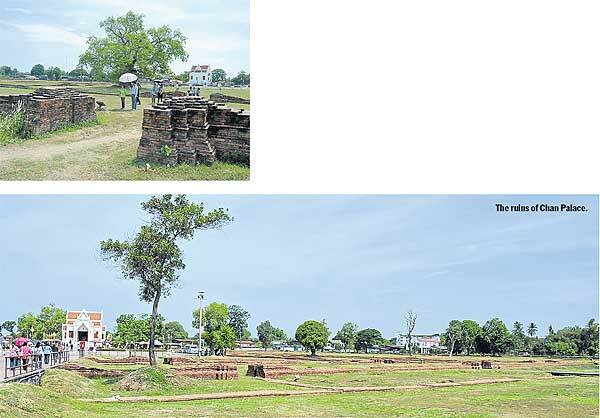 King Chulalongkorn (Rama V) also visited the site and made the observation that what was left of the palace's brick foundation resembled the Chantharapaisal royal mansion in Lop Buri's Narai Palace. Artifacts found at the site include fragments of pottery and roof tiles from kilns in nearby Si Satchanalai, Suphan Buri and Sing Buri provinces, as well as porcelains from China's Ming, Qing and Yuan dynasties, Japan (17th century) and Vietnam (14th-15th century). One of the most precious finds was a high-quality Chinese porcelain bearing the name of a Chinese emperor. This type of porcelain was usually presented along with fine silk as gifts to foreign kings via emissaries. Other interesting items unearthed were bronze containers and a bronze hairpin. Wat Wihan Thong is believed to be a royal temple and part of Chan Palace. Although there is historical evidence elsewhere noting that Phaya Lithai, a king of Sukhothai Kingdom (1347-68), stayed in Phitsanulok for seven years, none of the archaeological evidence recovered at Wang Chan was relevant to that period. And it is believed that King Chao Sam Phraya of Ayutthaya (1424-48) was the one who built the palace. Interestingly, he was born to a Sukhothai princess and married to a daughter of a Sukhothai ruler. King Chao Sam Phraya sent his son Phra Ramesuan to rule Phitsanulok. Later, when Phra Ramesuan ascended to the throne of Ayutthaya and took on the title of Somdet Phra Boromma Trailokanat, he returned to live in Phitsanulok _ altogether for 25 years _ to guard the northern part of the kingdom against the forces of King Tilokkarat of the Lanna empire. During this time Chan Palace might have undergone expansion and given a makeover to resemble the royal palace of Ayutthaya. After his reign, Phitsanulok was run by viceroys sent there from Ayutthaya. The palace was believed to have received a major renovation when Somdet Phra Maha Thammarachathirat ruled Phitsanulok as viceroy of Ayutthaya. His sons Somdet Phra Naresuan and Somdet Phra Ekathotsarot, both of whom later became kings, were born and grew up at Chan Palace. 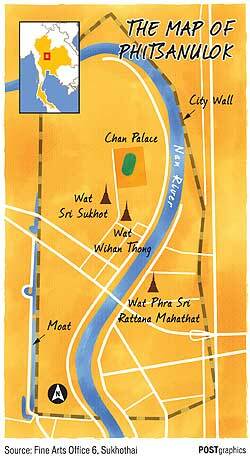 After the fall of Ayutthaya to the Burmese in 1569, Somdet Phra Naresuan was taken to Myanmar as a hostage. He later returned to rule Phitsanulok. After the reign of King Naresuan (1590-1605), there is no record of viceroys from Ayutthaya making Chan Palace their residence on a long term basis. This archaeological site also has the ruins of two Buddhist temples: Wat Wihan Thong south of the palace and Wat Sri Sukhot on the southeast. The former could well have been part of the palace, in accordance with the royal tradition to build a temple within palace grounds. Wat Wihan Thong was believed to be a royal temple. During the Thon Buri period, Phitsanulok was a battlefield most of the time, including during the war between King Taksin the Great and Chao Phra Fang rebels and the Siamese-Burmese war in 1775, archaeologist Thada Sangthong wrote in her article titled Chan Palace (Archaeological Excavations in 2003). "In 1775, Phitsanulok was burned down and its people fled. Since then Chan Palace has remained neglected." 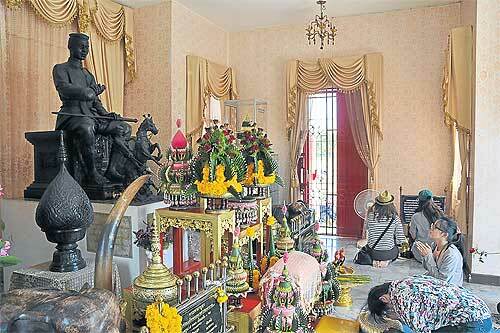 The shrine of King Naresuan the Great at Chan Palace, Phitsanulok.